Thermoguard Smoke & Flame Retardant Dualcoat Acrylic is the new standard of protection for interior walls and ceilings, offering more effective and longer lasting protection against flame spread and fire propagation than the usual British Standard Class 0, Thermoguard Smoke & Flame Retardant Dualcoat Acrylic additionally offers total control of smoke and flaming droplets. 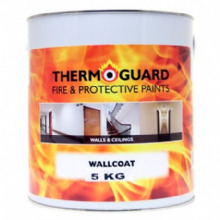 Thermoguard Smoke & Flame Retardant Dualcoat Acrylic can be applied over Thermoguard Wallcoat to upgrade high risk multi-layer painted surfaces as well as being applied as a standalone coating to upgrade medium risk painted surfaces. Currently both BS476 and BS EN comply, but BS 476 is rapidly being replaced by the more severe and realistic EN test including airflow.